The O Dochartaigh family were a branch of the Cenél Conail and traced their descent from Dochartach, who was ninth in descent from Conall Gulban. They were known as the Clann Fiamhain from Dochartach’s grandfather, Fiamhan. We know nothing of either Dochartach or Fiamhan. The earliest mention of the surname in the annals is in 1180 when Aindíles Ó Dochartaig died in Derry and his son was slain by Mágnas Ó Cellecháin. Who this father and son were remains a mystery, but clearly they were of some importance – compared to other leading families such as Ó Gallchobhair early references in the annals are scarce. On the death of Flaithbertach Ó Maíl Doraid, Echmarcach Ó Dochartaigh broke the bloody hold which the Uí Chanannáin and the Uí Maíl Doraid had on the kingship of Tír Conaill by taking it in 1197. Echmarcach’s reign was short lived, however, and he was killed a fortnight later opposing the Norman, John de Courcy, who had plundered Inishowen. In 1199 Domnall Ó Dochartaigh, lord of Cenél Énna and Ard Midair, in the barony of Raphoe, died, which is the first indication we have of where the homeland of the clann was before their removal to Inishowen. Cenél Énna lay between Lough Foyle and Lough Swilly, in the Lagan between Lifford and Letterkenny. Ard Midair lay west of that towards Lough Finn. In 1203 Domnall Carrach Ó Dochartaigh, lord of Ard Midair was slain by Uí Báegill after he had plundered churches. It is interesting that the entry in the Annals of Ulster refers to him as king of Tir Conaill at his death, while the Annals of the Four Masters which is reluctant to call any potentate king in the post-Norman period, calls him riogh-thaoiseach Árda Miodhair, ‘royal chief of Ardmire’. Conchubhair Ó Dochartaig, lord of Ard Midair, died in 1252. Two important developments took place after his death which led to Ó Dochartaigh rule in Inishowen. The first was the ending of the Mac Lochlainn kingship of Cenél Eógain, which included Inishowen, in 1241, and the second was the occupation of the peninsula by the Normans and the building of the great castle of Greencastle in 1305 by Richard de Burgh ‘the Red Earl’. By the time Domhnall Ó Dochartaig, lord of Ard Miodhair and Tír Énna died in 1342, Norman power had come to an end in Inishowen. The entry regarding Domnall’s death in the Annals of Ulster is significant for it says that he was almost lord of Inishowen ; uair is bec nach raibhi tighernus Innsi-hEoghain [aige]. The same annals are usually full in their praise of him and claim that few lords in Ireland had more subjects or a greater cavalry than he had. His son Seán, who is described as lord of Ard Midair, helped to depose Ó Domhnaill, Niall mac Aodha, 1343, and set up Áenghus Ó Domhnaill in his place. In 1380 the ruling Ó Dochartaigh was killed in battle while involved in another power struggle within the Ó Domhnaill camp. Conchobhar an Einigh Ó Dochartaigh at his death in 1413 is the first of the name to be called lord of Inishowen as well as of Ard Midair, ‘a man of generosity and general hospitality to the wretched and the poor…’ although three of his sons are described as lords of Ard Midair, but not of Inishowen. These were Domhnaill from whom, through his son, Brian Dubh, descended the main branch of the family, that of Elagh, and from whom his son, Eachmharcach, the Greencastle branch; and Seán Balbh, from whom descended the Inch and Buncrana branches. The Doagh branch is very early, descending from Tomilín, most likely to have been the brother of the lord of Ard Miodair, Domhnall, who died 1342. On Domhnall mac Conchobhair’s death in 1440 two of the family were nominated as Ó Dochartaigh, Brian Dubh, Domhnall’s son and his nephew, Aodh, son of Seán Balbh. This would indicate that there were now two lordships, one of Ard Midair, and one in Inishowen. This is borne out much later by the entry of the Annals of Ulster which says that Aodh Carrach son of the western Ó Dochartaigh was slain by Godfraidh Ó Catháin, ‘western’ here meaning Ard Midair. In the same year that the two lords were nominated, Neachtain Ó Domhnaill, who no doubt resented Ó Dochartaigh ambitions, attacked the castle of Culmactraine in the south of Inishowen. In the year of Seán’s death in 1511 and the accession of his nephew, Conchobhar Carrach, son of Brian Dubh, Art Ó Néill, lord of Tir Eoghain, invaded Tir Conaill and took hostages from Conchobhar. It must be remembered that Inishowen was part of Cenél Eóghain territory, that most of the leading families there, like that of Mac Lochlainn were themselves of the Cenél Eóghain and that the Ó Néill rulers of Tir Eóghain naturally laid claim to it. However, that claim was dropped in 1512 when Ó Domhnaill, Aodh mac Aoidh Ruaidh, plundered Tir Eóghain and forced Art Ó Neil to give up all claims he had on Inishowen, thus clearly demonstrating that Ó Dochartaigh was his subject lord. This agreement with Ó Neill was confirmed by charters in 1514 after hostilities had broken out again with Ó Domhnaill being the victor. In 1522 in another war with Ó Neill, Ó Dohertaigh is called Ó Domhnaill’s loyal follower, along with ÓBaoighill, Ó Gallchobhair and Clann t Suibhne. Conchobhar Carrach was succeeded by his uncle, Eachmharcach, who died in 1526, after which a contention arose about the succession. An outsider, Gearalt, of the Doagh branch, none of whose members had ever held the lordship of Inishowen, was finally chosen, but not to everyone’s satisfaction, for in 1537 Gearalt’s son, Niall, was killed by Ruaidhrí, son of Feilim Ó Dochartaigh, of the main branch of Elagh. On Gearalt’s death the lordship returned to the Elagh branch where it remained until 1608. Even after Gearalt’s death in 1540 the enmity between the two branches continued, and in 1543 Ruadhraighe and Seán, two sons of Feilim, who had succeeded Gearalt, murdered the latter’s son Cathaoir. This deed was speedily dealt with by Mághnas Ó Domhnaill who wished to display his own authority over Feilim and Inishowen. Feilim died in 1556 and was succeeded by his son Sean Mór. In October 1566 a garrison of English soldiers was established at Derry and at Culmore some miles along the Foyle to the north. Seán Mór provided the garrisons with provisions including cattle and helped to defeat Seán an Díomuis Ó Néill of Tir Eóghain when he attacked the English there the same month. In the ongoing hostilities between Ó Neill and Ó Domhnaill, Seán suffered at the hands of Toirdhealbhach Luineach Ó Neill’ s Scottish mercenaries in 1579, when they carried off 3,000 cattle from Inishowen. Seán Mór died in 1582, and his son Sean Óg was elected in preference to Cathaoir, brother of the dead lord, which resulted in the different factions going to war. Sean Óg, had married a daughter of Sean an Díomuis Ó Neill, and one of his sons by this marriage was the famous Cathaoir, last lord of Inishowen. In 1585 along with other lords of the North, he attended a parliament in Dublin and in 1588 he is listed as one of those lords who surrendered their lands to Queen Elizabeth I and been regranted them. In 1588 when he received reports that ships of the Spanish Armada had arrived in Inishowen he sent word to Richard and Henry Hovenden, who were in charge of a garrison at Burt Castle, that 700 Spaniards had arrived at Kinnago, where 200 or300 had perished. Seán Óg played a tight game, wanting to save the Spaniards but fearful of offending the English. He actually blamed Mac Suibhne [na dTuath] for having directed the Spaniards to Inishowen. In any case the Spaniards were attacked by the English near Elagh, Ó Dochartaigh’s main residence, stripped naked and many were slaughtered. Those that managed to get away were helped by Ó Dochartaigh, but his involvement in the whole affair is unclear. Later in the year he was imprisoned by Lord Deputy Fitzwillliam, who had demanded Spanish treasure but got none. He was not released until 1590. Sean Óg did not attend the inauguration of Aodh Ruadh Ó Domhnaill at Kilmacrenan in 1592, and for this disloyalty was taken prisoner and forced to submit to the new lord of Tir Conaill. He remained loyal, perhaps reluctantly, to Aodh Ruadh until his death in January, 1601. Aodh Ruadh Ó Domhnaill then had Feilim Óg, who was Sean Óg’s brother, inaugurated which infuriated the fosterers of Sean Óg’s son, Cathaoir. Cathaoir’s fosterers were Aodh Buidhe Mac Daibhid and his brother Feilim Riabhach and they approached Sir Henry Dowcra, the English governor of Derry, on their foster son’s behalf. Dowcra, who mistrusted the Mac Daibhid clann, reluctantly agreed to support the young Cathaoir, realising that Feilim Ó Docahartaigh had declared for Ó Domhnaill against Elizabeth, and that Cathaoir, who was a prisoner of Ó Domhnaill had promised to submit, along with his fosterers. The following summer Cathaoir was released by Ó Domhnaill through the guile of Aodh Buidhe mac Daibhid and on his return to Inishowen was well received. He was then styled Ó Dochartaigh by Dowcra. Cathaoir remained loyal to the English, was knighted, and in 1603 he visited King James I in London. The same year he was granted all lands that had been granted to his father Sir Seán Óg with the remainder to his brother Sir Seán, and his brother Ruaidhrí. In 1606 Sir Henry Dowcra surrendered the governorship of Derry to George Pawlett. A man who proved unpopular with everyone including his own soldiers, Pawlett wrote to the lord deputy, Chichester, that Cathaoir was preparing for revolt, a charge which Cathaoir denied. In 1608 Cathaoir was foreman of a jury that indicted the earls, Ruaidhri Ó Domhnaill and Aodh Ó Neill, after their flight from Rathmullan. In April of the same year as a result of a grave insult to his person by the governor, he surprised Derry, burned it and Pawlett was slain. Soon afterwards a proclamation was issued against Cathaoir and his fosterer, Feilim Riabhach, and by June, Cathaoir had fled Inishowen. When help from Ó Gallchobhair was not forthcoming, Cathaoir left Glenveagh, where he was hiding, and on the 5 July he was overcome and slain at Kilmacrenan. His lands were held forfeit, and his wife Mary Preston, daughter of Viscount of Gormanstown, was held under arrest in Dublin. She was later given a pension of £40 per annum. In May of 1609 Cathaoir Ó Dochartaigh’s lands were granted to Sir Arthur Chichester. In an Inquisition taken at Derry in November, 1602, the following Ó Dochartaigh gentlemen are listed: ’Hugh Boy Mc Cahir’ and ’Averkagh Mc Shan’ both of Greencastle, ‘Dwaltagh Mc Hugh’ in Buncrana, Shane in Glannoganell, ‘Shan McDwaltagh’ in Gleneely,’Brian Mc Tirlogh Chy’ in Malin, among others. In another inquisition, in November, 1603, the following Ó Dochartaigh gentlemen are mentioned, ‘William’of Dungrennon and ‘Ferdoragh McCahir of Termon Neile. Only one proprietor of the name is mentioned in the Civil survey, as having been in possession in Inishowen in 1640 –‘ Richard Oge O Dogherty’ of Kenogh in the parish of Clonca. In the census of 1659 among those listed as tituladoes in Inishowen were ‘ Rory’ and ‘Phelomy’ in the parish of Desertegney, ‘Cahair, Thomas’ and ‘Rory’ in the parish of Clonca, ‘Gerauld’ and ‘Cahair’ of Donagh, Conn in Clonmany. In all there are over two hundred families of the name noted in the peninsula, by far the most numerous of any clann. On the other hand there are only sixteen numbered for the barony of Raphoe, the original homeland of the family, and none for the barony of Kilmacrenan. The Hearth Money Rolls list more than one hundred and thirty-taxpayers of the name! In 1989 Dr Ramón Ó Dochartaigh of Cádiz in Spain was recognised as head of the family by the Chief Herald. He is a direct descendant of Cathaoir Ó Dochartaigh’s brother Seán. In 1790 Dr Ó Dochartaigh’s ancestor, John, a minor, with his two brothers were sent to Spain, where John became a naval officer. 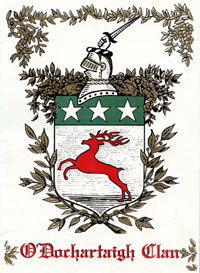 The three brothers were granted arms by the chief herald’s predecessor in 1790 about the time of their departure from Ireland.